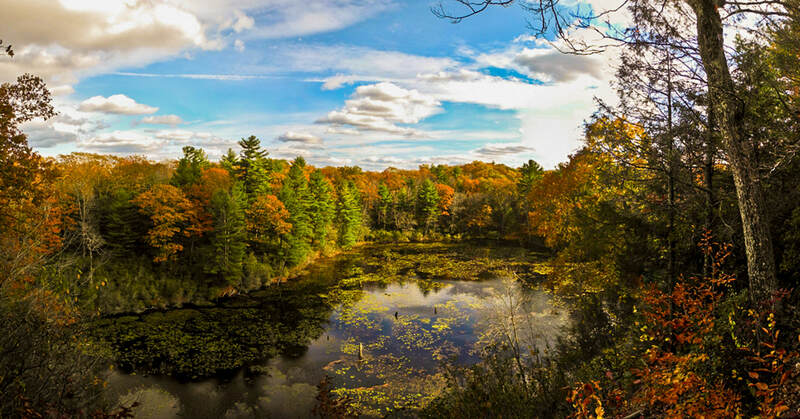 The Mattatuck Trail features a woodland footpath beside ponds and streams, descends through a ravine framing the spectacular terraced Buttermilk Falls, meanders past a cave frequented by the legendary Leatherman, and crosses one of Connecticut’s highest peaks. From its southern terminus in Wolcott, the trail follows a northwesterly route to the Mattatuck State Forest and Black Rock State Park. The trail ascends along the western ridges of the Waterbury Reservoirs with breathtaking views to the north. In Litchfield the Mattatuck Trail passes through the White Memorial Conservation Center, a 4,000 acre wildlife sanctuary which includes a network of supplementary side trails. The trail resumes in Warren in the Wyantenock State Forest. It quickly enters City of Waterbury Shepaug Reservoir land and Warren Land Trust open space property. The trail traverses rugged terrain featuring mountain laurel, seasonal views of the reservoirs to the east, streams and marshes, and deep woodlands. The northernmost section of the Mattatuck Trail travels through the Mohawk State Forest in Cornwall, one of the most scenic woodland areas in Connecticut. Meandering beside streams and through rock walls, the trail climbs Mohawk Mountain and offers outstanding panoramic views of western Connecticut and the hills of New York. The Mattatuck’s northern terminus is at its junction with the blue-blazed Mohawk Trail.